by Jeffery A. Jenkins & Eric M. Patashnik (eds). Chicago: University of Chicago Press, 2012. Cloth $90.00, ISBN: 9780226396446, Paper $29.00, ISBN: 9780226396453, E-book $7.00-$29.00, ISBN: 9780226396460. Will the Patient Protection and Affordable Care Act be repealed or severely amended? Can key provisions of the Civil Rights Act of 1965 be reconstructed or endure after the Supreme Court decision in Shelby County v. Holder? Should today’s youth count on receiving Social Security? These are all important questions regarding the state of the American nation, and to a certain extent answers can be gleaned through reading Living Legislation. Edited by Jeffrey A. Jenkins and Eric M. Patashnik, the text’s thesis revolves around the notion that much research has been performed on legislation as it travels through the legislative process, but a significant dearth of academic study analyzes what happens to legislation after it becomes law. The book advocates the notion that statutes are living entities, and the legislative process does not end when the President signs a bill into law. As Jenkins and Patashnik state near the end of their introduction, “[t]he achievement of ‘landmark legislation’ thus comes to be seen not as a one-off triumph but rather as a multistage process. Enactment must be followed by diligent maintenance and consolidation, lest the initial legislative victory be for naught” (p.17). The book is divided into three parts and contains thirteen chapters; rather than summarizing each, I have picked a few to focus on that were especially relevant and/or illuminating. 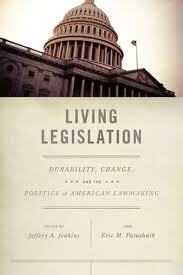 Legal scholar William Novak provides a fascinating chapter on the making of the modern American legislative state. He begins by acknowledging the work of other legal scholars that study legislation on a more formal level, such as Jeremy Waldron, William Eskridge, Elizabeth Garrett, and John Ferejohn. In particular, he cites Waldron’s The Dignity of Legislation, noting that the text “draws on democratic and political theory to challenge the scholarly neglect of legislation and to reestablish the priority and value of the most democratic and representative branch of government” (p.21). He also notes that Eskridge and Ferejohn’s A Republic of Statutes examines ideas similar to Living Legislation, but from more of a legal perspective. Novak’s chapter claims that a transformation occurred in American legislation after reconstruction but before FDR, allowing public law initiatives to extend into daily American social and economic life far beyond those of previous generations. This happened because of three developments: (1) the rise of legal [*345] positivism, (2) redefinition of liberalism, and (3) the new conception of police power. In regard to the ascension of positivism, Auguste Comte and John Austin had much influence, and, eventually, “American thinking about the relationship of the law to the state” was transformed (p.26). Following this, a wave of “new liberalism” infiltrated America, bringing with it a notion of positive liberty and also renewed notions of the public good and common welfare. Finally, Novak discusses the rise of police power, which he defines as “the authority of the government to regulate private interests, property, and behavior on behalf of the public health, safety, morals, order, and welfare” (p.37). Modern legislation needed to be more responsive to public policy needs, because the traditional common law route of assessing statutes was burdensome. Laws such as the Pure Food and Drug Act (1906), the Mann Act (1910), the Harrison Narcotics Tax Act (1914), the Child Labor Tax Act (1919), and the National Prohibition Act (1919) were a few examples of this modern legislative policymaking. Along with Jenkins and Patashnik’s introduction, Part I provides a stimulating overview of the text and cogently presents the fundamental ideas of what the text has to offer. Part II begins with a contribution by Cohen and Eshbaugh-Soha about the President’s legislative policy agenda, which they track throughout almost the entire history of the American Republic. For those that believe the modern presidency begins with FDR, the authors may surprise you: presidential legislative requests to Congress only began to rise almost a decade after his presidency. Nevertheless, FDR surely impacted the substance of legislative policy that Congress dealt with by shifting Congressional efforts mostly to domestic policy and dropping areas that his predecessors focused on, such as judicial organization, military organization, and international organization. Congressional focus of such policy domains was supported by examining four focus areas: sovereignty, government organization, international relations, and domestic policy. The most surprising numbers revealed are the drop in sovereignty issues from around 35% of requests in the beginning Congresses to about 2-3% of requests in contemporary congresses, and the rise in domestic policy requests, which began at around 17% and now hover in the mid-60s. In terms of the durability of presidential agenda change, it is found that recent gridlock in Washington has led to more stability regarding agendas. Ultimately, the authors point to four factors that significantly affect durability: presidential preferences, federal revenue, interest and inflation rates, and war. A chapter by Berry, Burden, and Howell tracks the stability of federal government programs that were established from 1971 – 2003. The piece is largely a retort to Herbert Kaufman’s Are Governmental Organizations Immortal?, which found that since 1923 only 27 of 421 agencies had been eliminated. Contrary to Kaufman’s results, Berry et al. find that many governmental programs change over time and not an insignificant number of them die. However, if a program survives for a decade, then it “become[s] increasingly likely to continue without alteration” (p.96). Additionally, it is vital that programs gain support from Republicans and [*346] Democrats, and many also need time to gain the backing of interest groups, agencies and other experts. In terms of specific factors that may lead to mutation or death, Berry, Burden and Howell find that changes in congressional coalitions, a low GDP, war, and divided government all contribute. Additionally, they note that public opinion may be a factor, as “[w]hen the public calls for less government activity, programs are in fact more likely to be altered or eliminated” (p.103). This chapter has obvious implications for the Affordable Care Act, and for other entities, such as the Consumer Financial Protection Bureau and Social Security. One theme throughout the text is demonstrating the ill-effects that divided government can have on both federal programs and legislation in general. Chapter 6 discusses these effects, noting that “laws enacted under conditions of divided government are more likely to be amended at any given point in time than those enacted in a period of unified control” (p.126). Additionally, individual characteristics of laws may impact their durability: complex laws are less durable and more likely to be amended. Divisiveness is also another factor that lends to amendment. Although certainly informative, specific examples of laws would have made the data a bit less abstract. Some important limits also concern Maltzman and Shipan’s work: the researchers did not address whether amendments were strengthening or weakening legislation. This is a significant limitation regarding the shape and life of a law, because popularity may fluctuate over time, thus allowing for strengthening or weakening amendments. Co-editor Patashnik delivers an insightful chapter which highlights the Tax Reform Act (TRA) of 1986 and airline deregulation. Examining the role of expert ideas, political entrepreneurship and strategic framing, he contends that, in contrast to the functionalist argument of social efficiency, “reforms must continually generate political support if they are to stick” (p.148). Crucial to generating political support are two things: political structures and policy feedback effects. The TRA unraveled “not only because its enacting coalition was replaced by coalitions with different preferences, but also because many of the original drafters failed to keep their reform commitments” (p.156, emphasis removed). The TRA suffered death by a thousand cuts, as laws passed in the 1990s and 2000s virtually eliminated its force and opened the floodgates for tax breaks and other loopholes. Airline deregulation was another matter, as the reform thoroughly reconfigured the airline industry, thus entrenching it into the market and “generat[ing] shifts in the identities, governance, and strategies of clientele actors” (p.162). Two major factors driving deregulation were expert analyses and symbolic politics, as both helped to deflate the power of traditional party politics. Concluding, Patashnik proposes four general standards for the study of “living legislation”: (1) both the existence and the direction of change must be distinguished; (2) the full range of policy changes need to be examined; (3) the development of public policies must be studied in its own right; and (4) the study of policy development “cannot be understood without examining the material, organizational, and cognitive impacts of public policies on key societal actors, including clientele [*347] groups, program beneficiaries, and service providers” (p.174). Part II ends with a couple interesting chapters by Stuart Chinn and Vesla Weaver on how political losers and policy failures continue to influence legislation. Chinn takes a view of policy development through the lens of the Supreme Court. His thesis is that “the Supreme Court has played a pivotal role in the creation of social order precisely because its actions, prompted by political losers, are crucial in helping to determine just how much institutional change will occur, and how much coalitional fault lines may or may not be problematized, in the aftermath of reform” (p.199). To demonstrate this he focuses on New Deal legislation, particularly the Wagner Act of 1935, and how the Supreme Court delimited the legislation through a series of decisions, thus handing small but significant victories to the original political losers. While Chinn’s analysis is intriguing and appears to be supported by evidence in that particular situation, it is not well-established that this holds true in other areas, such as civil rights, women’s rights, and environmental issues, for instance. The Hollow Hope, a book about how courts, and the Supreme Court in particular, struggle to produce social change, has much to say about these topics, and should have been referenced at some point. Weaver’s chapter examines the profound impact that the Safe Streets and Crime Control Act of 1968 had on the American criminal justice system. Though many academics consider the law a failure, Weaver demonstrates how it led to a burgeoning of not just the U.S. prison population (even during times of decreasing crime), but also to the study of criminal justice and to a radical shift in state laws. Prior to the law’s passage, law enforcement had largely been considered a state interest. Transformation into a federal issue occurred through a series of policy feedback loops created by Title I of the Act, which produced the Law Enforcement Assistance Administration (LEAA). The LEAA became one of the fastest growing federal agencies in the 1970s and before it was disbanded, had dispersed 155,720 grants for a total of 80,000 projects; in short, “[c]riminal justice became a major new role for the federal government” (p.227). Weaver’s accompanying statistics are astonishing: spending for criminal justice tripled from 1968 to 1985; 6,350 new criminal justice agencies were formed within a decade; law enforcement agencies rose from 14,806 to 19,298; police forces doubled and correctional employees tripled from 1960-1980. Even the study of criminal justice exploded during this time period: in 1966-67, 184 colleges and universities had criminal justice programs, but by 1980 over 1,500 colleges and universities offered such programs. An examination of legislative hearings demonstrated how anti-federal assistance advocates turned once they saw the potential monetary impact the LEAA had on their organizations. Researchers have previously documented the growth of the criminal justice system in detail, but Weaver’s analysis demonstrates that a large portion of this growth can be tied mainly to the Safe Streets Act. The LEAA also had a significant impact on the drafting of state legislative proposals and pending legislation through the creation of State Planning Agencies, or SPAs, that could submit comprehensive plans [*348] for improving law enforcement. States used these SPAs to rewrite their criminal codes and hold conferences on sentencing, corrections and judicial reform. In fact, from 1971-81 every single state altered its sentencing policy in some fashion and half of states produced a major revision of their criminal codes; these were largely the result of grants provided by the LEAA that were specifically focused on updating state criminal justice systems. Along with Patashnik’s chapter on airline deregulation and tax reform, Weaver’s chapter is the most convincing, and demonstrates how legislative longevity extends far beyond the initial passage of laws. The book does have some less engaging chapters. In one that appears to be aimed specifically at the unpopularity of the Affordable Care Act, Amihai Glazer attempts to demonstrate how unpopular policies become popular. Yet the piece seems rushed and no new empirical materials are introduced, leaving it mostly speculative. Additionally, the least convincing empirical chapter is David Lewis’ on policy durability and agency design. The fact that political branches exert less control over independent commissions and that White House, congressional committee, and interest group influence differs based on the type of agency are not revolutionary findings, and all seem a bit a priori. Still, on balance it is a valuable volume, concluding with two insightful chapters by David Mayhew on law being a cognitive enterprise and by Sidney Milkis on the politics of the policymaking state. In addition to allowing two enormously influential academics to put their stamp of approval on the work, these chapters further describe how “living legislation” may be studied in future work. So, after all of this new information, can we tell what will happen to the Patient Protection and Affordable Care Act? Not quite. The fact that the measure was divisive and extremely complex does not bode well for its future. Conversely, the fact that the law was such a large and deep reform provides that dismantling or eliminating it will be difficult, especially after the major aspects commence in 2014. Thus, Obamacare could be here for a long while. Eskridge Jr., William N. and Ferejohn, John (2010). A Republic of Statutes. New Haven: Yale University Press. Kaufman, Herbert. (1976). Are Governmental Organizations Immortal? Washington, D.C.: Brookings Institution Press. Rosenberg, Gerald N. (2008). The Hollow Hope: Can Courts Bring About Social Change? (2d ed)Chicago: University of Chicago Press. Waldron, Jeremy. (1999). The Dignity of Legislation. Cambridge: Cambridge University Press. Shelby County v. Holder 570 U.S. ____ (2013).